TWO Pottery dinnerware sets. 3-4pc handmade set of dishes. Wouldn't your favorite dish look and taste better on these custom pottery dishes? Forget Grandma's china, handcrafted pottery is the new family heirloom! 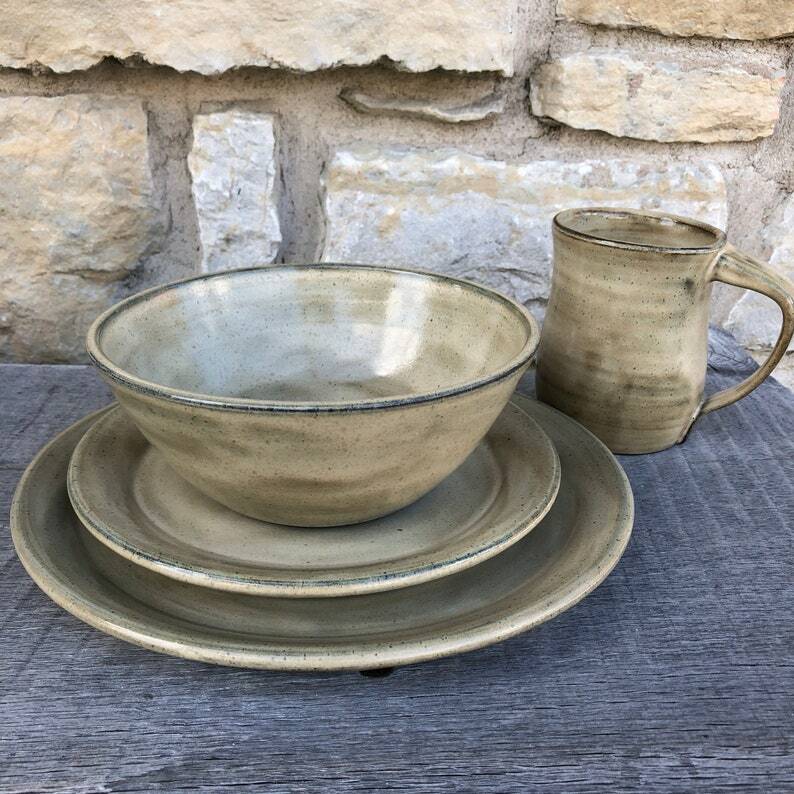 Pottery dinnerware set includes 2 of each wheel thrown stoneware 10.5" dinner plate, 6-7" x 2.5" bowl, 7" salad plate, 14-16 oz pottery mug (optional). This 3-4pc pottery dinnerware set is glazed in Birch, lead free glaze. The result is a unique cream with brown and blue speckles the dark brown clay can be seen through textured areas. A one-of-a-kind pottery dinnerware set that will be a pleasure to use for years to come! All handcrafted pieces are wheel thrown, trimmed, signed, glazed, and fired to cone 6 by me! Each piece will be unique. Food safe, microwave safe, dishwasher safe! These sets are MADE TO ORDER. Please note the current production time during checkout.